Purpose: To describe the consequences of the cranial displacement of the diaphgram occurring during pneumoperitoneum (Pnp) and/or Trendelenburg (Tnd) position on respiratory mechanics. Possible addictive effects and the changes of the viscoelastic respiratory system resistance were studied, which were not extensively described before. Methods: The end-inflation occlusion method was applied on eight rats. It allows us to determine mechanical parameters such as respiratory system static elastance, the ohmic resistance due to frictional forces in the airways, and the additional viscoelastic impedance due to tissues deformation. Measurements during mechanical ventilation were taken in controls (supine position), after 20-25° head-down tilting (Tnd), after abdominal air insufflation up to 12 mmHg abdominal pressure in the supine position (Pnp), and combining Tnd + Pnp. Tnd and Pnp modalities were similar to those commonly applied during surgical procedures in humans. Results: We confirmed the previously described detrimental effects on respiratory mechanics due to the diaphgram displacement during both Pnp and Tnd. 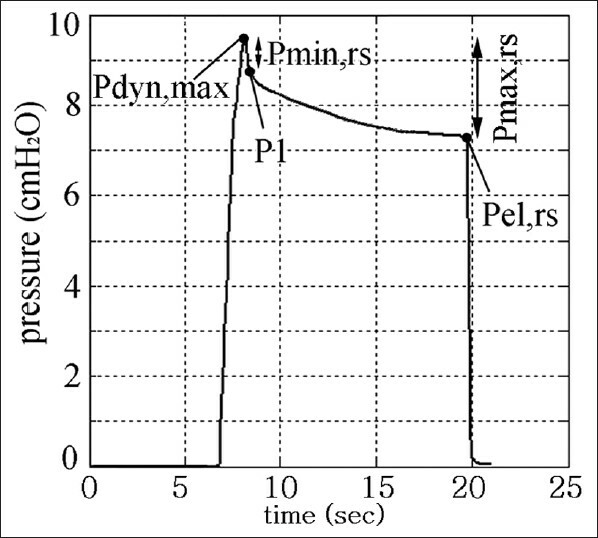 The increment in the total resistive pressure dissipation was found to depend primarily on the effects on the viscoelastic characteristics of the respiratory system. Data suggesting greater effects of Pnp compared to those of Tnd were obtained. Conclusion: The cranial displacement of the diaphgram occurring as a consequence of Pnp and/or Tnd, for example during laparoscopic surgical procedures, causes an increment of respiratory system elastance and viscoelastic resistance. The analysis of addictive effects show that these are more likely to occur when Pnp + Tnd are compared to isolated Tnd rather than to isolated Pnp. Objective: Newly arising enlarged or hypermetabolic mediastinal/hilar lymph nodes (LNs) in patients with previously diagnosed extrathoracic malignancies raise suspicion of metastasis. Relatively high proportion of these LNs is due to a benign condition. We aimed to determine frequency of malignant LNs and role of endobronchial ultrasound-guided transbronchial needle aspiration (EBUS-TBNA) for clarification of the origin of suspicious LNs in these patients. Methods: Consecutive patients with a known extrathoracic malignancy and suspected hilar/mediastinal LN were included in this prospective study. Computed tomography (CT) of thorax and positron emission tomography-CT of all patients were taken. LNs with short axis >1 cm at CT of thorax and SUV ≥ 2.5 were accepted suspicious for malignancy. All patients underwent EBUS-TBNA for pathological verification of LNs. Patients with benign diagnosis either underwent invasive procedures or were followed up. The results were evaluated for frequency of malignant hilar/mediastinal LNs and sensitivity, specificity, and diagnostic values of EBUS-TBNA. Results: A total of 48 cases with a mean age of 57.4±11.6 were included. All cases had the diagnosis of an extrathoracic malignancy. 78 LNs were aspirated with EBUS-TBNA in 48 cases (1.62 LNs/patient). The mean short axis of aspirated LNs was 1.51±0.63. 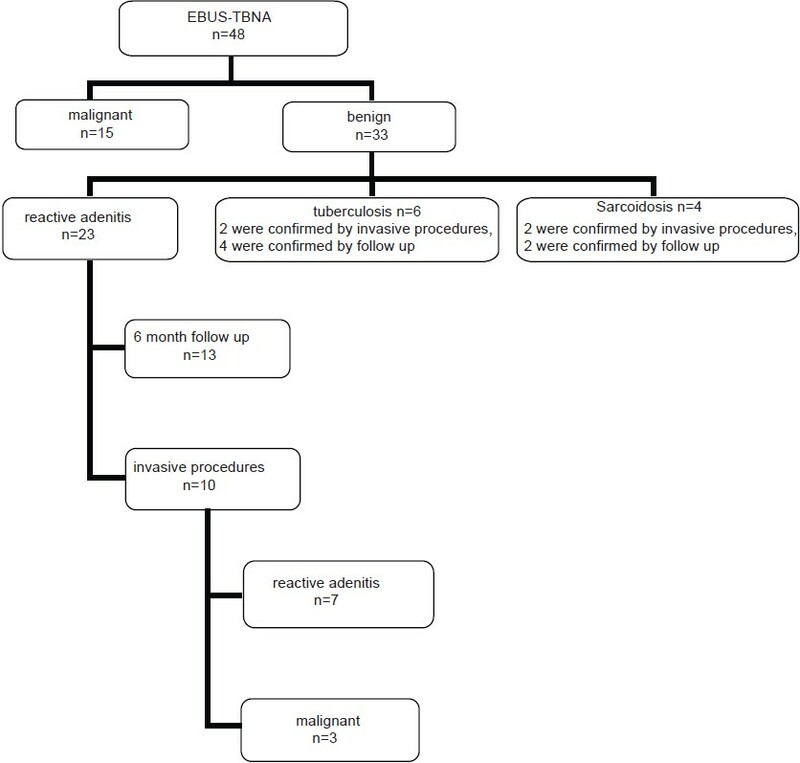 Results of EBUS-TBNA revealed malignancy in 15 cases (31.2%), tuberculosis in six cases (12.5%), sarcoidosis in four cases (8.3%), and reactive adenitis in 23 cases (48%). The sensitivity, specificity, and negative predictive value of EBUS-TBNA for malignancy were 83.3%, 100%, and 90.9%, respectively. When both benign and malignant diseases were considered, sensitivity, specificity, negative predictive value, and diagnostic accuracy of EBUS-TBNA were 89.2%, 100%, 86.9%, and 93.7%, respectively. Conclusions: The ratio of benign LNs in patients with extrathoracic malignancies is relatively high. EBUS-TBNA is a safe, minimally invasive, and effective method for clarification of intrathoracic LNs. Context: Prevalence of tuberculous pleural effusion is very high in the Asian subcontinent but very few studies have come up from this part of the world about the course of recovery of pulmonary functions after institution of anti-tubercular therapy (ATT) and thoracentesis. Aims: To study initial lung function impairment, changes over time after institution of ATT and thoracentesis and residual abnormalities left at the end of six months of treatment. Settings and Design: Randomized open level interventional study over two years in 52 patients at a tertiary level teaching hospital. Methods: The study population was divided into two equal groups, A (therapeutic thoracentesis) and B (diagnostic thoracentesis). Spirometry, chest radiograph and ultrasonography of thorax were done initially and at each follow-up visit up to six months. Statistical analysis was done (P value < 0.05 considered significant). Results: Both groups were comparable initially. After six months none in group A and five patients in group B had minimal pleural effusion. 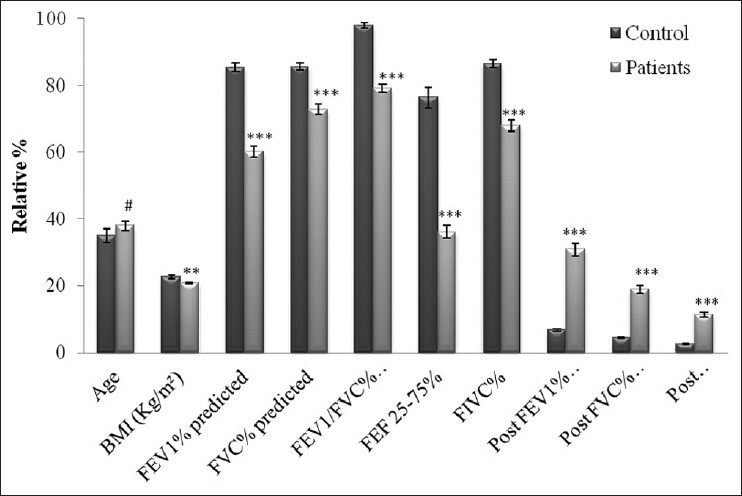 During follow up, mean percentage predicted of FEV1 and FVC increased more in A than in B and the differences were statistically significant (P < 0.05). Pleural thickening, initially absent in both groups, was found to be more in B as compared to A at subsequent follow-up visits and this was statistically significant (P < 0.05). 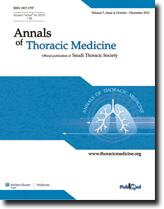 Conclusions: Thoracentesis should be considered in addition to anti-TB treatment, especially in large effusions, in order to relieve dyspnea, avoid possibility of residual pleural thickening and risk of developing restrictive functional impairment. Background: Noninvasive diagnosis of pleural tuberculosis (TB) remains a challenge due to the paucibacillary nature of the disease. As Mycobacterium tuberculosis (MTB)-specific T cells are recruited into pleural space in TB effusion; their indirect detection may provide useful clinical information. Objectives: Evaluation of pleural fluid interferon (INF)-γ levels vs Quantiferon−TB Gold In tube assay (QFT- IT) in blood and its adapted variants, using pleural fluid or isolated pleural fluid cells in the diagnosis of pleural TB. Methods: Thirty-eight patients with pleural effusion of unknown etiology presented at Assiut University Hospital, Egypt, were recruited. Blood and pleural fluid were collected at presentation for INF-γ assays. Ex vivo pleural fluid INF-γ levels, QFT-IT in blood and its adapted variants were compared with final diagnosis as confirmed by other tools including blind and/or thoracoscopic pleural biopsy. Results: The final clinical diagnosis was TB in 20 (53%), malignancy in 10 (26%), and effusion due to other causes in eight patients (21%). Ex vivo pleural fluid INF-γ levels accurately identified TB in all patients and were superior to the QFT-IT assays using blood or pleural fluid (70 and 78% sensitivity, with 60 and 83% specificity, respectively). QFT-IT assay applied to isolated pleural fluid cells had 100% sensitivity and 72% specificity. The optimal cut-off obtained with ROC analysis was 0.73 for TB Gold assay in blood assay, 0.82 IU/ml for the cultured pleural fluid assay, and 0.94 for isolated pleural cells assay. Conclusion: The ex vivo pleural fluid INF-γ level is an accurate marker for the diagnosis of pleural TB. QFT- IT assay in peripheral blood or its adapted versions of the assay using pleural fluid and/or washed pleural fluid cells had no diagnostic advantage over pleural fluid INF-γ in the diagnosis of pleural TB. Context: Asthma is a chronic airway disorder which is associated to the inflammatory cells. 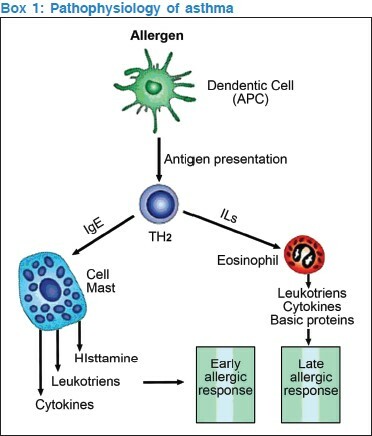 Inflammatory and immune cells generate more reactive oxygen species in patients suffering from asthma which leads to tissue injury. Aims: To investigate the role of oxidant-antioxidant imbalance in disease progression of asthmatic patients. Settings and Design: In this study, 130 asthmatic patients and 70 healthy controls were documented. Methods: For this malondialdehyde level, total protein carbonyls, sulfhydryls, activity of superoxide dismutase (SOD), catalase, glutathione peroxidase (GPx), total blood glutathione, and total antioxidant capacity (FRAP) were measured. 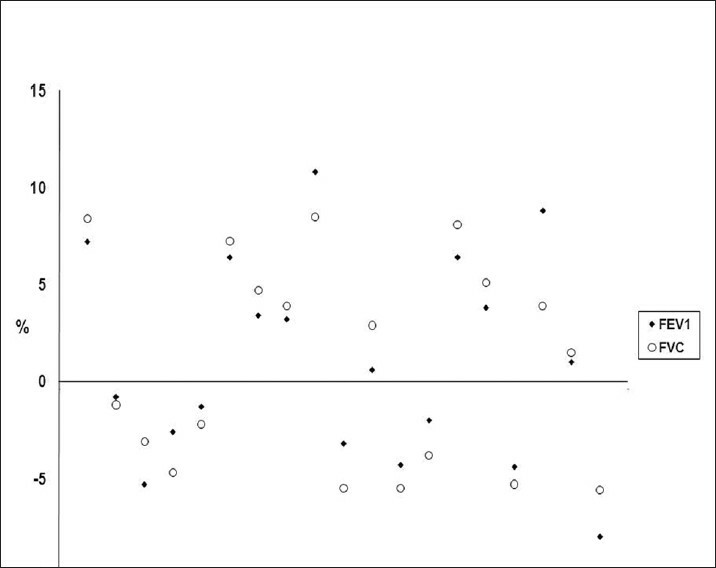 Statistical Analysis Used: Analysis of the data was done using unpaired student t test and one-way ANOVA analysis. P < 0.05 was considered significant. Results: The present work showed that the systemic levels of MDA (4.19 ± 0.10 nmol/ml, P < 0.001) and protein carbonyls (1.13 ± 0.02 nmol/mg, P < 0.001) were found to be remarkably higher in asthmatic patients while protein sulfhydryls (0.55 ± 0.01 mmol/l, P < 0.05) decreased as compared to controls (2.84 ± 0.12 nmol/ml, 0.79 ± 0.02 nmol/mg and 0.60 ± 0.02 mmol/l, respectively). We also observed decrease in activities of SOD (2047 ± 50.34 U/g Hb, P < 0.05), catalase (4374 ± 67.98 U/g Hb, P < 0.01), and GPx (40.97 ± 1.05 U/g Hb, P < 0.01) in erythrocytes compared to control (2217 ± 60.11 U/g Hb, 4746 ± 89.94 U/g Hb, and 48.37 ± 2.47 U/g Hb, respectively). FRAP level (750.90 ± 21.22 ΅mol/l, P < 0.05) in plasma was decreased, whereas total blood glutathione increased (0.94 ± 0.02 mmol/l, P < 0.05) as seen in control (840.40 ± 28.39 ΅mol/l and 0.84 ± 0.04 mmol/l). Conclusions: This work supports and describes the hypothesis that an imbalance between oxidant-antioxidant is associated to the oxidative stress which plays a significant role in severity of the disease. Introduction: Neodymium:yttrium aluminum garnet (Nd:YAG) laser resection is one of the most established interventional pulmonology techniques for immediate debulking of malignant central airway obstruction (CAO). The major aim of this study was to investigate the complication rate and identify clinical risk factors for complications in patients with advanced lung cancer. Methods: In the period from January 2006 to January 2011, data sufficient for analysis were identified in 464 patients. Nd:YAG laser resection due to malignant CAO was performed in all patients. The procedure was carried out in general anesthesia. Complications after laser resection were defined as severe hypoxemia, global respiratory failure, arrhythmia requiring treatment, hemoptysis, pneumothorax, pneumomediastinum, pulmonary edema, tracheoesophageal fistulae, and death. Risk factors were defined as acute myocardial infarction within 6 months before treatment, hypertension, chronic arrhythmia, chronic obstructive pulmonary disease (COPD), stabilized cardiomyopathy, previous external beam radiotherapy, previous chemotherapy, and previous interventional pulmonology treatment. Results : There was 76.1% male and 23.9% female patients in the study, 76.5% were current smokers, 17.2% former smokers, and 6.3% of nonsmokers. The majority of patients had squamous cell lung cancer (70%), small cell lung cancer was identified in 18.3%, adenocarcinoma in 3.4%, and metastases from lung primary in 8.2%. The overall complication rate was 8.4%. Statistically significant risk factors were age (P = 0.001), current smoking status (P = 0.012), arterial hypertension (P < 0.0001), chronic arrhythmia (P = 0.034), COPD (P < 0.0001), and stabilized cardiomyopathy (P < 0.0001). Independent clinical risk factors were age over 60 years (P = 0.026), arterial hypertension (P < 0.0001), and COPD (P < 0.0001). Conclusion : Closer monitoring of patients with identified risk factors is advisable prior and immediately after laser resection. In order to avoid or minimize complications, special attention should be directed toward patients who are current smokers, over 60 years of age, with arterial hypertension or COPD. Background and Objective: Some studies show a decline of FEV 1 only one month after withdrawal of inhaled corticosteroids (ICS), while others show no decline. We speculate that the presence of an asthma phenotype in the Chronic Obstructive Pulmonary Disease (COPD) population, and that its exclusion may result in no spirometric deterioration. Methods: We performed a prospective clinical observation study on 32 patients who fulfilled the Global Initiative for Chronic Obstructive lung disease definition of COPD (Grade II-IV). They were divided into two phenotypic groups. 1. Irreversible asthma (A and B) (n = 13): A. Asthma: Bronchial biopsy shows diffuse thickening of basement membrane (≥ 6.6 ΅m). B. Airflow limitation (AFL) likely to be asthma: KCO > 80% predicted if the patient refused biopsy. 2. COPD (A and B) (n = 19): A. COPD: hypercapneic respiratory failure with raised bicarbonate, panlobular emphysema with multiple bullas, or bronchial biopsy showing squamous metaplasia and epithelial/subepithelial inflammation without thickening of the basement membrane. B. AFL likely to be COPD: KCO < 80% predicted. Results: The asthma phenotype was significantly younger, had a strong association with hypertrophy of nasal turbinates, and registered a significant improvement of FEV 1 (350 ml) vs a decline of - 26.5 ml in the COPD phenotype following therapy with budesonide/formoterol for one year. Withdrawal of budesonide for 4 weeks in the COPD phenotype resulted in FEV 1 + 1.33% (SD ΁ 5.71) and FVC + 1.24% (SD ΁ 5.32); a change of <12% in all patients. Conclusions: We recorded no spirometric deterioration after exclusion of the asthma phenotype from a COPD group. Background: Isolated pulmonary amyloidosis is a very rare disease. Methods: We retrospectively reviewed the records of patients with pathologically proven isolated pulmonary amyloidosis treated at our hospital from 1990 to 2011. Results: There were 9 males and 4 females with a mean age of 54.7 years (range, 45-72 years) and the mean course of disease was 46.5 months (range, 5 months-15 years). The most common symptoms were cough (10/13), expectoration (8/13), hemoptysis (4/13), chest tightness (12/13), dyspnea (10/13), chest pain (3/13), fever (5/13), and body weight loss (2/13). Radiological findings included tracheal stenosis (2/13), bronchial stenosis with atelectasis (5/13), pulmonary nodules (3/13), lung consolidation (1/13), and lymph node enlargement with pleural effusion (2/13). Treatments included endotracheal stenting, endoscopic resection of tracheal and bronchial lesions, lung resection, and drug therapy with glucocorticoids, antineoplastic agents, or antibiotics. Four patients died of the disease within 1 year of diagnosis, 2 died of pneumonia at 3-4 years after original treatment, and the remaining patients are alive with follow-up ranging from 3 to 15 years. Conclusions: Isolated pulmonary amyloidosis is a rare disease with a relatively high mortality and its various manifestations make diagnosis challenging. Surgical resection of lesions and chemotherapy tend to be effective treatments. 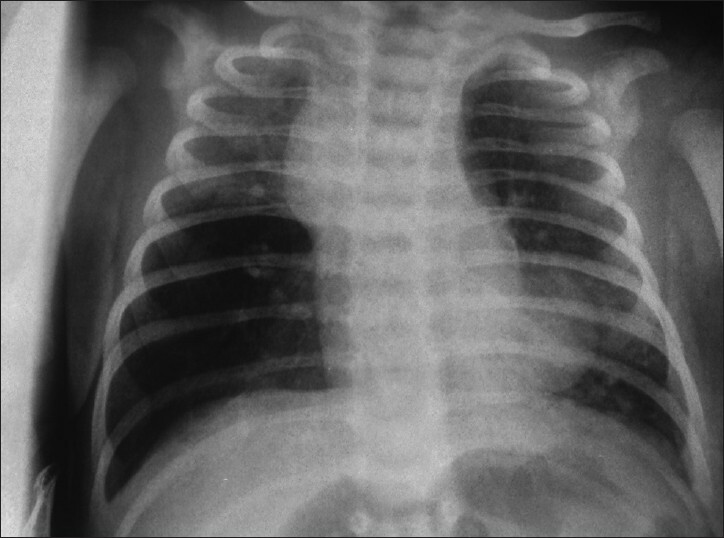 We report a rare case of bilateral congenital lobar emphysema in a 2-month-old male infant who presented with severe respiratory distress leading to respiratory failure. Plain chest X-ray and later high-resolution CT scan of the chest revealed that both the right middle and the left upper lobes were emphysematous. Surgical excision of the affected lobes has been done successfully in two sequential operations of right middle lobectomy followed by left upper lobectomy which resulted in significant improvement of respiratory status. In this report, the presentation, diagnosis, and surgical management of this rare condition are discussed.